One of the pleasures of publishing Eat Drink Boulder is the chance to get together regularly with our writers and hear their informed, sensitive, always opinionated and often hilarious takes on the Boulder food and drink scene. The feature articles they write are masterful condensations of their views, but at our gatherings, the opinions come out unfiltered and unsweetened. At our gathering last month, we sampled the wares of a small selection of Boulder’s more popular “fast casual” restaurants. Fast casual is a booming market sector, thanks in no small part to the success of Colorado-born Chipotle, and new establishments are getting significant props for their healthier fare. Snootier foodies may turn up their noses at the implied production values of even smaller “franchise restaurants”, but like the revitalization of the television drama in recent years, a form that once uniformly sacrificed quality to the imperatives of mass-market distribution has now come of age, offering quality meals at a decent price, with conscientious attention to standards and sourcing. This series includes the consensus views on each of the restaurants we sampled, each reported by a different writer. Our gathering was especially convivial (thanks to the simultaneous wine-tasting! ), but our critical faculties and opinionated tastes were in fine form. Establishments we covered were Native Foods Cafe (below), Half Fast Subs, ModMarket, Larkburger, Moe’s BBQ and Protein Bar (coming soon). Enjoy the selection! Aspiring to be “America’s premier fast-casual vegan restaurant group”, Native Foods might be champion even if it had competition. Lacking a contender with anywhere near their reach, passion and quality, they take that crown by default. But how do they stack up against non-vegan offerings? Our group was uniformly complimentary about the Native approach, atmosphere and customer service. The restaurant itself, tucked in an inside corner of the 29th St. mall, has the clean lines and natural light typical of the quick casual design aesthetic. The order takers are knowledgeable and courteous, and roaming staffers ask if they can re-fill your water glass within seconds. After a handful visits in the last month, I’ve observed the clientele to be an interesting mixture of teens waiting for their movie to start and healthy-looking forty- and fifty-something couples happily digging into multi-colored salads, wraps and bowls. At our tasting, we sampled the Japanese Sesame Crusted Chicken Bites (Super Slaw, Japanese togarashi spice, mango-lime chili sauce), the vegan Chicken Wings, and the Meatball Sub (seitan meatballs, marinara sauce, caramelized onions, roasted red peppers, pumpkin seed pesto, ranch dressing and Parmesan on a grilled baguette.) The jury was mixed on the Chicken Wings (I give them a thumbs up, but a notch below the seitan wings at City O City in Denver), while the Japanese Chicken Bites met with greater favor. 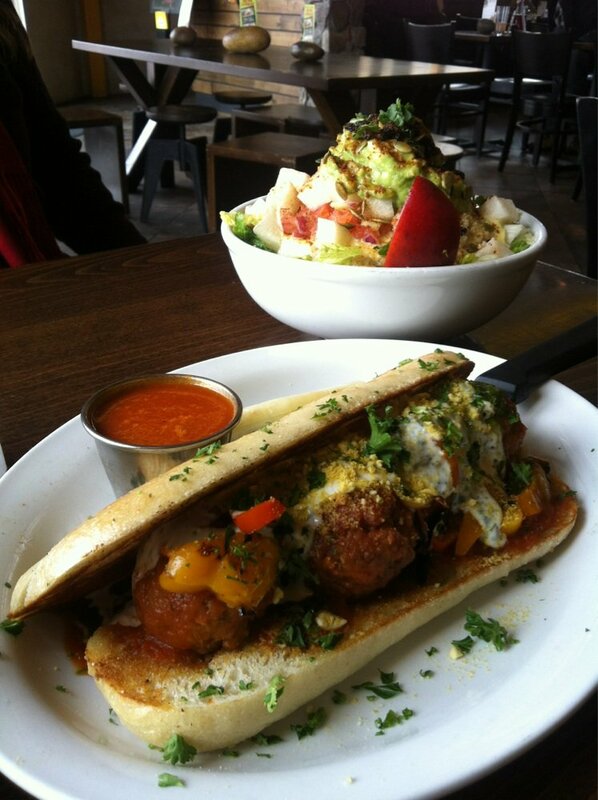 The meatball sub was the go-to meal for many who had been to Native Foods before, with special props for the combination of sauces, veggies and cheese created to perk up the seitan. I suspect Native Foods already has its committed followers. If you have not tried it yet, it is well worth an exploratory visit, where you should sample as many items as possible. There is a good chance you’ll find something supremely inventive and flavorful, and henceforth keep it in the rotation for the times you are choosing among the posse of quick casuals in the vicinity (Mod Market, Motomaki, Chipotle, Noodles, Pei Wei, Garbanzos).